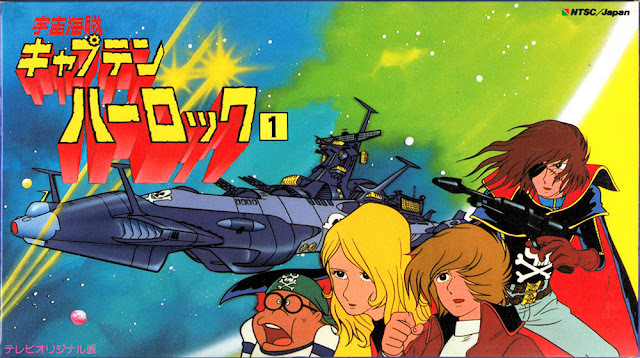 A thousand years from now and forty years after the fact, Americans can finally enjoy Leiji Matsumoto's Toei Animation space-fantasies Space Pirate Captain Harlock and Galaxy Express 999. Now you at home can join the millions enthralled by anachronistic SF tales of commuter rail between galaxies and/or the pillaging of outer space in a switchblade-equipped space battleship. Once only available through underground fansub or kiddie VHS release, now both series are available on domestic DVD and on streaming video services, with English subtitles. But can modern American audiences enjoy Japanese TV cartoons from decades past - especially cartoons that casually defy category and genre? Both series began in early 1977 as simultaneous manga serializations - the Captain Harlock manga, by the way, is now available in English from Seven Seas. By 1978, in the midst of a Star Wars inspired SF boom, the Matsumoto-directed Farewell To Space Battleship Yamato: Soldiers Of Love drove film audiences to romantic tears. 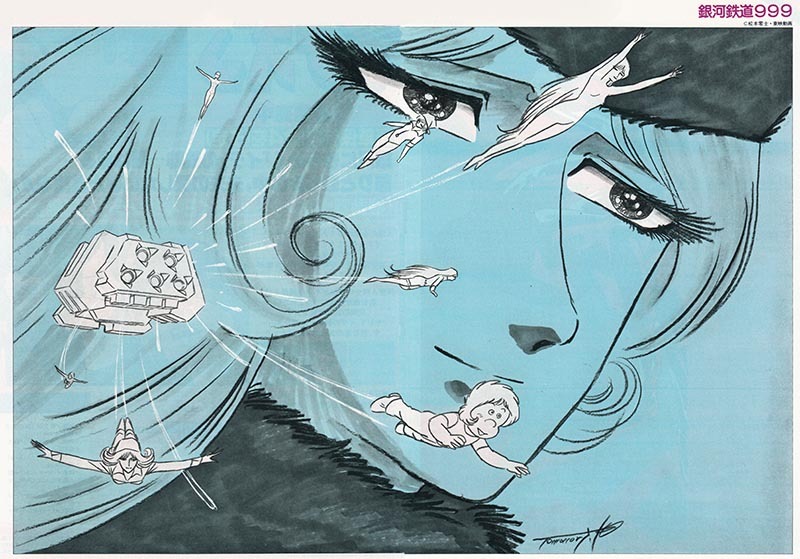 On television Leiji's touch was evident in Office Academy's Yamato 2, and two Matsumoto-created Toei series SF Saiyuki Starzinger and Danguard Ace displayed his talent for expressive space opera. It was time for Space Pirate Captain Harlock. 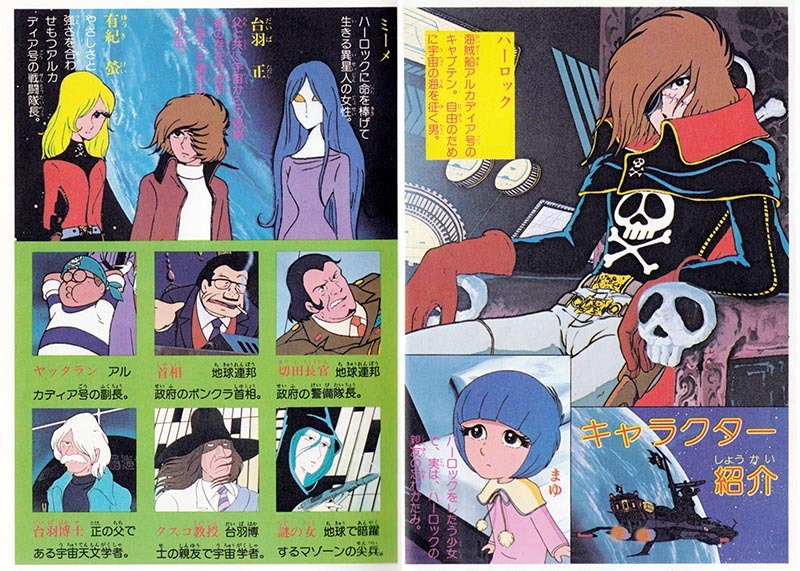 Decked out in eyepatch and cloak, festooned with Jolly Rogers, Captain Harlock proves clothes make the man. Or the pirate. Harlock defies the corrupt and confused Earth of 2977 A.D. at the helm of the pirate ship Arcadia, the only starship with both faster-than-light drive and delicate filigreed woodworking. 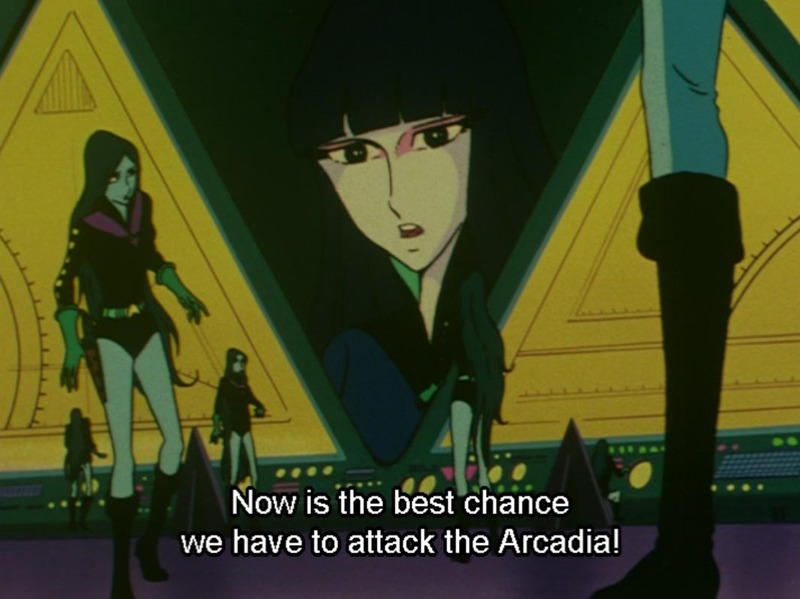 When our planet's original leaseholders, the green-skinned vegetable women empire of Mazone, return to take possession in a city-destroying, Von Daniken-style ancient astronaut assault, only Harlock and his forty fellow space pirates can save us all. Alongside 70s anime classics like Future Boy Conan, Science Ninja Team Gatchaman II, Fighting General Daimos and Daitarn 3, Space Pirate Captain Harlock debuted in March of 1978 and ran 42 episodes Thursdays at 7 on your local TV Asahi affiliate. Staffed by anime all-stars including Chief Director Rin Taro and character designs by the great Kazuo Komatsubara, Harlock would become an instant legend. The series opens as the crew of the Arcadia, consisting of teenage rebel girl Kei Yuki, alcoholic Doctor Zero, mystery alien woman Miimay, Yattaran the plamodel-otaku first mate, and other assorted pirates, cats, and birds, are joined by Tadashi Daiba, a hot-headed youth determined to avenge the death of his astronomer father at the hands of the Mazone. Led by the beautiful Queen Lafresia, the Mazone attack Earth via ultra-modern starship invasion and from ancient tombs long hidden in Earth's depths. 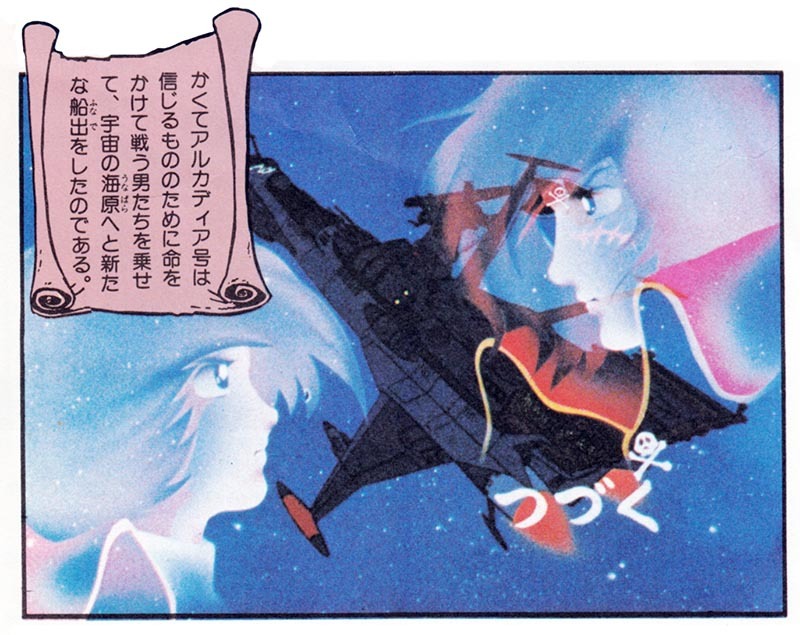 Yet for all its super science and pirate vengeance, the linchpin of Captain Harlock is the little girl Mayu, the orphaned daughter of the Arcadia's designer, Harlock's friend Tochiro Oyama. Harlock must honor his pledge and defend Mayu from both the conniving of Earth's security director General Kiruta and from evil plans of the Mazone, and that means defending Earth itself, not for the lazy wastrels currently infesting it, but for the future Mayu represents. Idiosyncratic and expressionistic, Harlock's moody style stems not only from Matsumoto's characters but from Rin Taro's bold directorial hand. Who else would stop the narrative dead to show Harlock moping in his cabin while Miimay, "the woman who gave her life to Harlock", strums her lyre and matches him drink for drink? Rin Taro's melodramatic split-screen cosmo-gun showdowns are illuminated by lightning, and the depths of outer space roil and surge like the ocean. It's a quirky show that one minute gives you the tear-jerking trials of an orphaned child and the next shows masked vigilantes racing through metropolitan streets intent on vaporizing beautiful women. The animation visibly struggles with some of the more elaborate outer-space scenarios, but the occasional Rin Taro or Shoken Ikuyo-directed episode comes to life with flashing bursts of movement and creativity. Is there another SF show that would interrupt a tale of interplanetary betrayal and vengeance with a shamisen solo? Matched by Seiji Yokoyama's stirring, breathless orchestral score, the series is unapologetically melodramatic. Like its namesake, Space Pirate Captain Harlock wanders freely through the universe, paying lip service to its story arc but frequently detouring to highlight the backstories of Arcadia's crew or remind us of the treachery inherent in beautiful plant-women. The series reaches a satisfying space-opera climax amidst the wreckage of a gigantic space battle as Queen Lafresia and Harlock duel hand to hand for, you guessed it, the fate of the Earth. Harlock and the Arcadia would vanish into space at series' end, but would return in the 1981 film Arcadia Of My Youth, which features a WWII flashback and a contradictory origin story for Harlock. This film would in turn be followed by Arcadia's television sequel, Endless Orbit SSX. 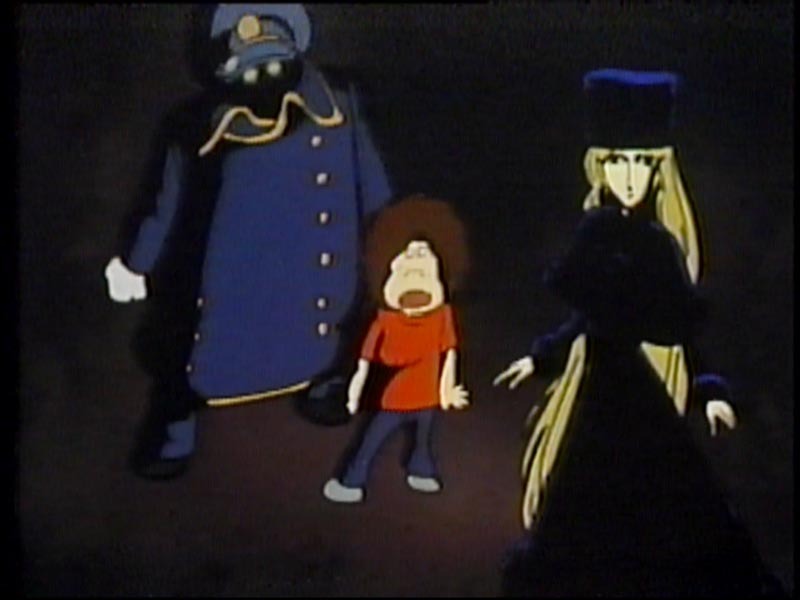 Harlock and the Arcadia would also guest-star in another Leiji Matsumoto anime series now available online, the second topic of this column, Galaxy Express 999. 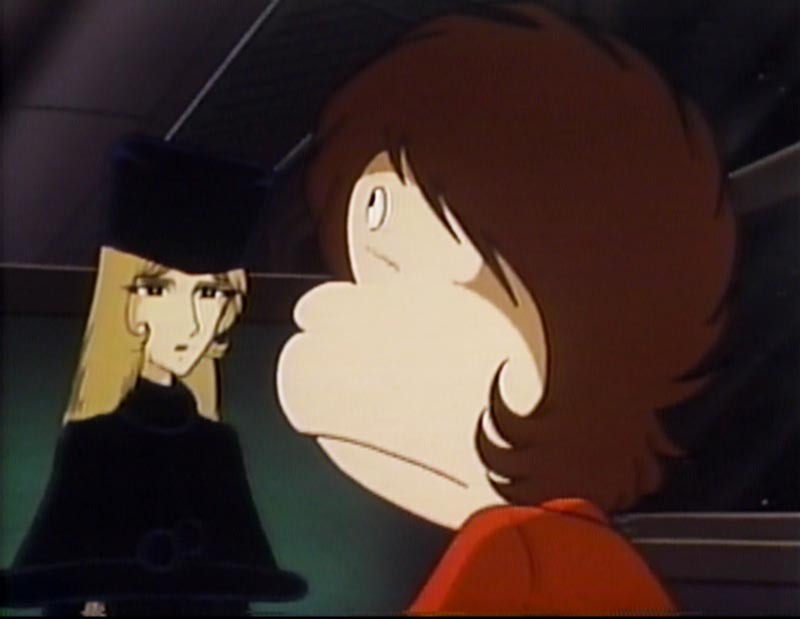 Galaxy Express 999 shares Harlock's retro-future motifs, but fundamentally is a different viewing experience - a philosophical science-fiction fairy tale celebrating human life, shot through with surprising amount of melancholy and regret. Thousands of years from now humanity has spread throughout the galaxy, but human nature hasn't changed much. The wealthy are embracing transhumanism and switching to eternal machine bodies that never wear out, while the less fortunate live and die as second-class citizens. 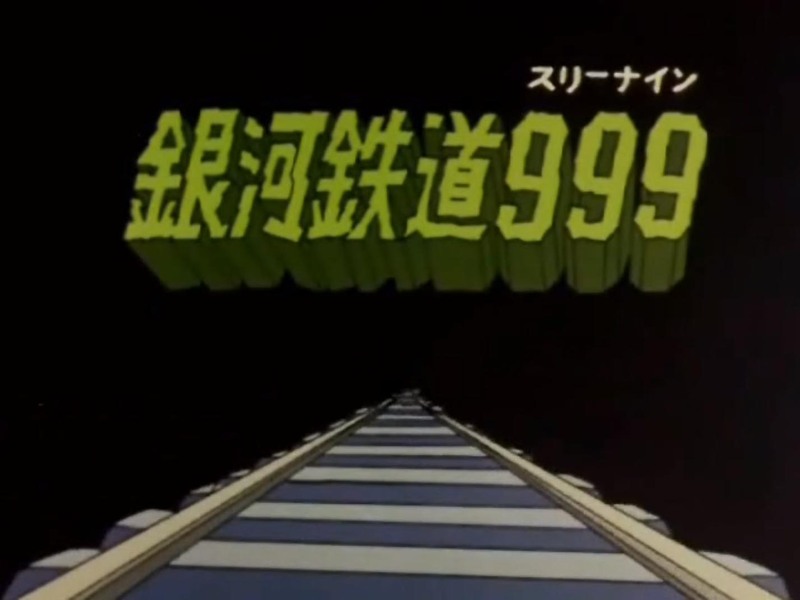 After his mother is killed by a human-hunting machine man, young Tetsuro Hoshino vows to travel on the Galaxy Express 999 and get his own immortal machine body. That's when he meets the mysterious beauty Maetel, a long-legged vision in black sable who offers Tetsuro what he wants most in the world, an unlimited pass on the 999. What is Maetel's true purpose? Will a machine body bring Tetsuro happiness? The answer lies on the 999. Galaxy Express 999's trip began on Fuji TV in the fall of 1978. Under the workmanlike Chief Direction of Nobutaka Nishizawa (Dragon Quest, Silver-Fang Ginga, Mazinger Z) with character setup by the versatile Shingo Araki (Devilman, Glass Mask, Mapletown, Saint Seiya, Rose Of Versailles), Galaxy Express's look is more consistent than Harlock, but at the expense of some of the earlier show's dash and sparkle. Eschewing Harlock's action-adventure milieu, 999 instead embraces its fairy tale ethos with fantastical worlds populated by the bizarre and the homely, the beautiful and the whimsical. Tomonori "Ideon" Kogawa 999 illustration from "My Anime"
Planets are literally carved in half between technology and primitivism, there are hollow worlds where fat, globular cattle are corralled in mid-air by fat, globular cowboys, we visit a foundry planet where it rains screws and we see a manga library planet stuffed with the works of Leiji Matsumoto, and on every world the melancholy of Tetsuro's loss is referred to again and again, giving the show a unique emotional depth. Just as Space Battleship Yamato drew upon previously existing "flying battleship" concepts, Galaxy Express 999 can trace its genesis to Kenji Miyazawa's 1927 novel Night On The Galactic Railroad, a meditative, allegorical tale of children traveling through the stars on a steam train (itself adapted into an anime film with an all-cat cast in 1985). 999 itself is a thoughtful series that asks big questions in between scenes of Tetsuro vaporizing evil machine men with his Cosmo-Gun. As the train whistle-stops its way through the galaxy, planet by planet Tetsuro begins to see the emptiness of a never-ending mechanical life. 112 episodes later Tetsuro and Maetel arrive at Planet Promecium, the home of the mechanized empire, the planet where eternal machine bodies are handed out to all comers no questions asked. Will Tetsuro abandon his limited life? What secret shame does Maetel hide? Did they really meet Captain Harlock in episode 83? All will be revealed as the 999 reaches its final destination! Of course, the 999 never really reaches the end of the line. Fresh from Harlock, Rin Taro would direct a 1979 Toei theatrical version of Galaxy Express. This lushly backgrounded and tightly animated film has remained a classic, and was followed by an equally lush yet perhaps completely superfluous 1981 sequel, Adieu Galaxy Express 999: Andromeda Terminal. Neither series received a proper contemporaneous English-language North American release. 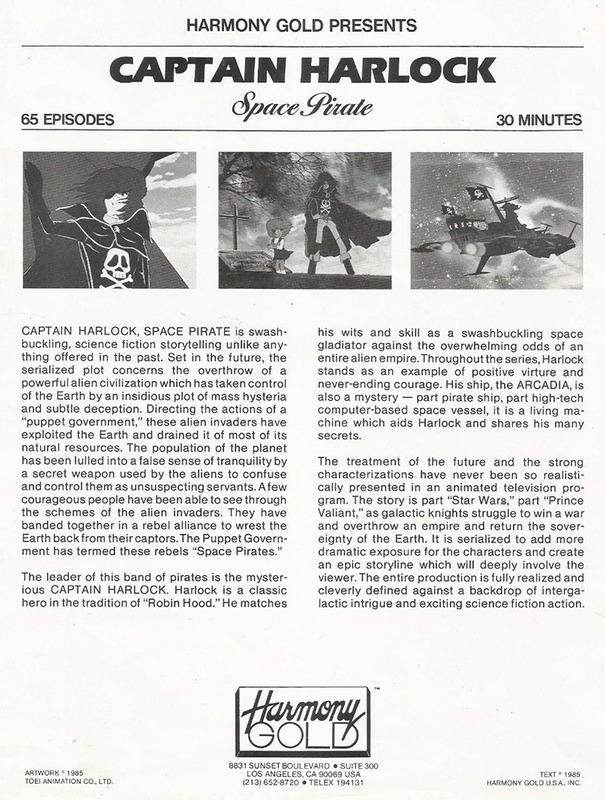 Of coure Quebec went crazy for their own Francophone Harlock, retitled "Albator," while the United States had to make do with a mere 4 episodes of Captain Harlock whimsically dubbed for home video in the early 80s. Television producer Harmony Gold's next project after their mid-80s success with Robotech was an edited-together mashup of Harlock and another Matsumoto series, 1981's Queen Millenia, syndicated on American TV with the unwieldy title Captain Harlock And The Queen Of 1000 Years. Harmony Gold would also dub two of the Galaxy Express television specials for worldwide distribution, changing Maetel's name to "Catherine" in the process. 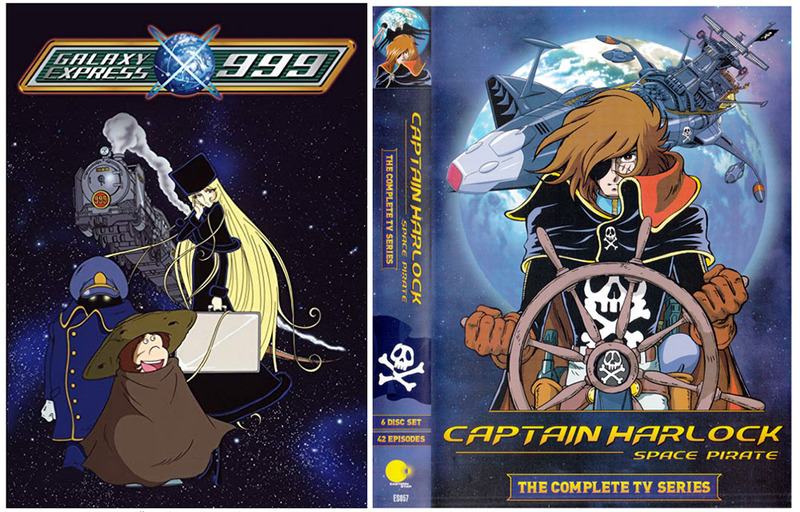 Both Space Pirate Captain Harlock and Galaxy Express 999 also aired on American television in the 1970s and 1980s as subtitled programs seen on various Japanese-language UHF and cable TV stations, that is until Fuji-TV noticed and pulled the plug. 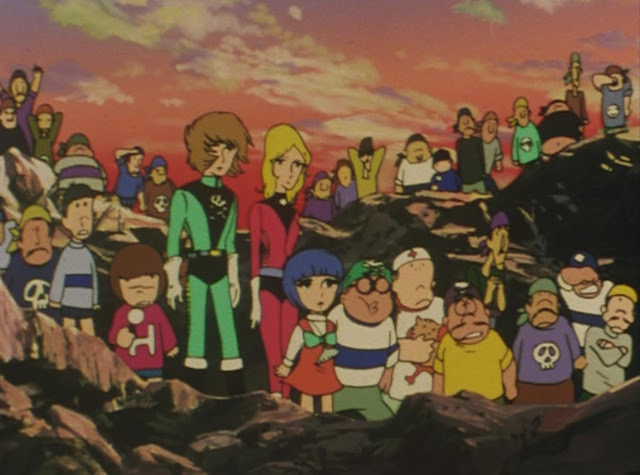 Of course, here in the 21st century the availability of television programs is vastly improved, and you can look at Captain Harlock and Galaxy Express for proof. Both shows can be streamed on your PC or media device from Crunchyroll or Tubi TV, and they both received DVD releases, Harlock in a handsome 2013 set from the fine people at Discotek Media, and Galaxy Express the previous year in a not-so-handsome set from bargain-bin licencors S'More Entertainment. Though domestically unavailable for years, the influence of both Galaxy Express and Captain Harlock as old-school figureheads was always felt in American otaku circles, from the ubiquitous Harlock cosplayers seen at anime conventions from California to Baltimore, mistakenly licensed Malibu comic book reimaginings of Harlock, Viz's 1990s release of the rebooted Galaxy Express 999 manga, and of course the inevitable Japanese remakes and re-imaginings of both series produced by an idea-hungry anime industry. 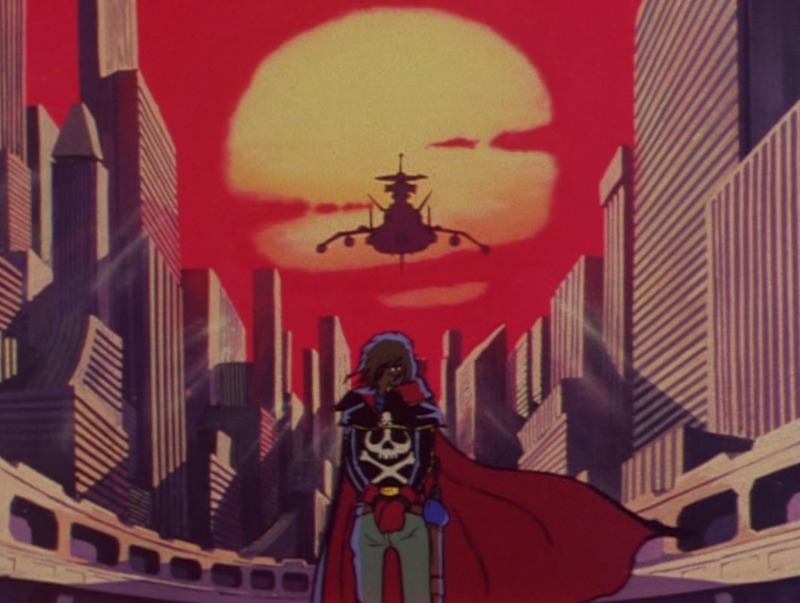 Revisiting the originals, we may find the 1970s animation a little ragged, the scripts maybe a little bare-facedly melodramatic or philosophical; and yet Captain Harlock and Galaxy Express 999 may turn out to be worth waiting decades for. It's easier than ever for us in the West to enjoy these series, and I hope you all give them a chance on your device of choice. If you're curious to find out what classic anime streaming options are out there for you, I encourage you to check out the handy list provided by the Anime Nostalgia Tumblr!